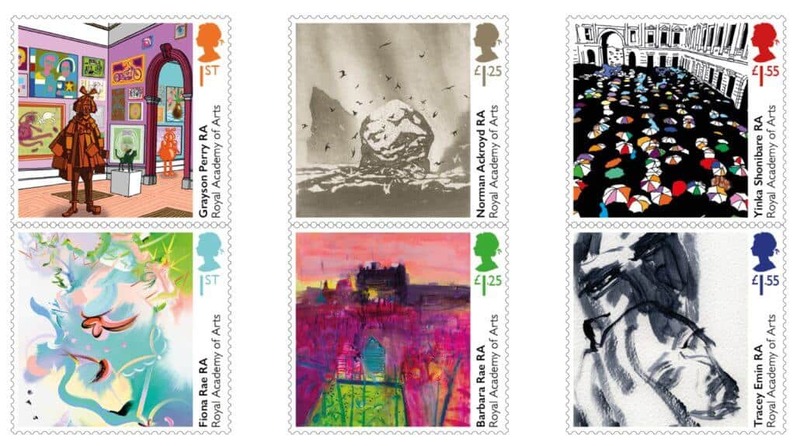 In celebration of its 250th anniversary, the Royal Academy of Art (RA) commissioned four artists – Yinka Shonibare, Greyson Perry, Tracey Emin and Fiona Rae – as well as two painter-printmakers – Barbara Rae and Norman Ackroyd – to create a set of special stamps for the Royal Mail. Each design is the result of a reflection on the artist’s personal practice, and the RA’s annual Summer exhibition ­– held yearly, uninterrupted since 1769. In line with these stamps comes a £56 million expansion to the RA’s campus, including free displays, new places to eat, drink and shop, and a new lecture theatre. 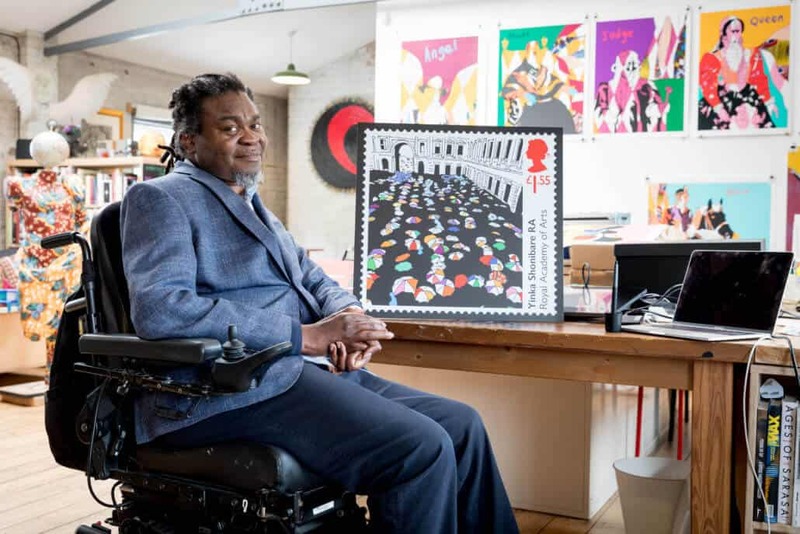 Artist Yinka Shonibare with his Royal Mail stamp at his studio in London. © Royal Mail. 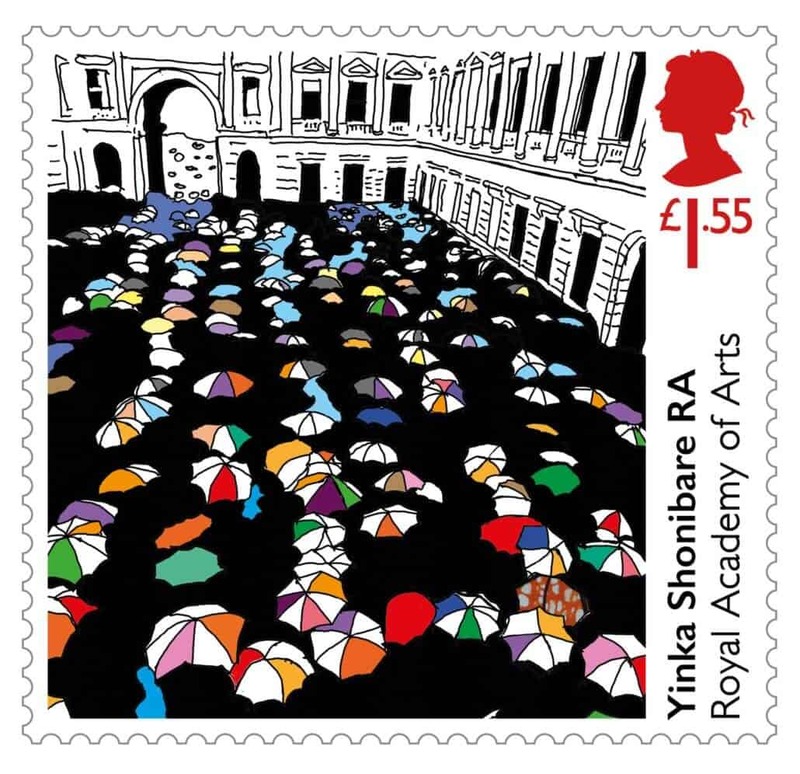 Shonibare, a British-Nigerian artist, designed his stamp from an image kept in the RA’s archives: a crowd queuing to see a Turner retrospective in the 1950s, where a group of characteristically British umbrellas wait patiently in the rain. Seen from above, and captured by an unknown photographer, the image is both aesthetic and typically British. In an article published by The Guardian, Shonibare comments that he “just really like[d] the graphic, the perspective, the reduction” of the image. Distilled down to its bare essentials, only the outlines of the umbrellas are visible, and have been livened up by bright colours. One umbrella, barely noticeable and in the bottom right-hand corner of the stamp, carries an African print that is so quintessentially a part of the artist’s work. Yinka Shonibare’s stamp artwork for the Royal Academy’s 250th year. © Royal Mail. This particular photograph was also used in an artwork Shonibare was commissioned to create for the RA: a 71-metre-long ‘wrapping’ that covered the scaffolding which surrounded the RA’s Burlington Gardens construction site. A collage made from photographs drawn from the Academy’s archive, and which illustrate its history, the ‘wrapping’ was up for the duration of the RA’s renovations – almost two years. Other specially created stamps for the Royal Mail include pictorial landscapes by Ackroyd and Barbara Rae; an intimate Saying Goodlbye portrait of her dying mother, by Emin; a witty take on the RA’s Summer Exhibition by Perry; and a bright, abstract, miniature painting by Fiona Rae. 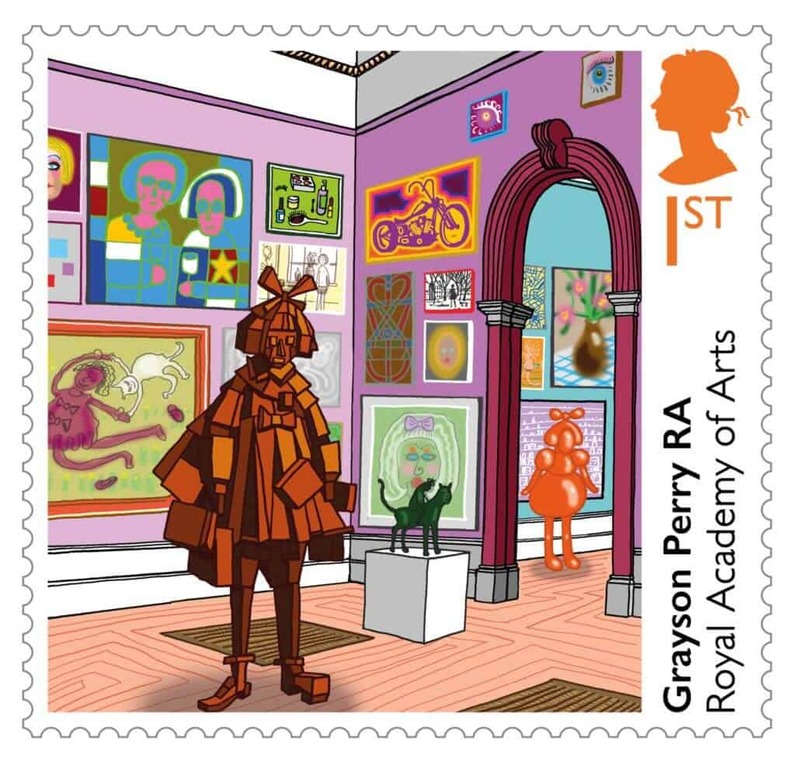 Grayson Perry’s stamp artwork for the Royal Academy’s 250th year. © Royal Mail. To commemorate the momentous occasion of the 250th anniversary of the RA, Grayson Perry will be coordinating the Summer Exhibition which opens to the public on the 12th June. FEATURED IMAGE: The entire set of the Royal Academy stamps commissioned by the Royal Mail in celebration of the Academy’s 250th year. © Royal Mail.